Fall is definitely here. The leaves are changing, it's getting chilly, and suddenly I'm craving the warm, cozy scent of cinnamon as well as pumpkin baked goods. 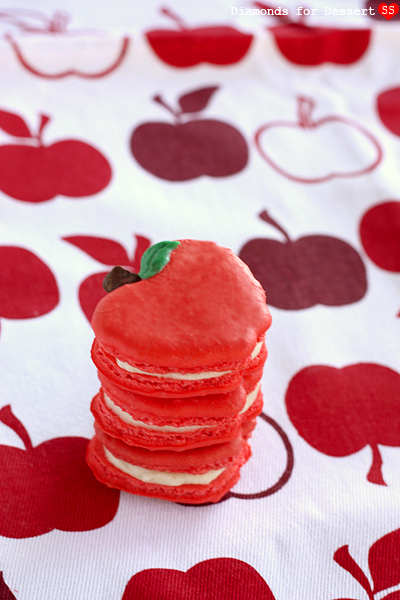 I say it's the perfect time to bake some Cinnamon "Apple" Macarons. 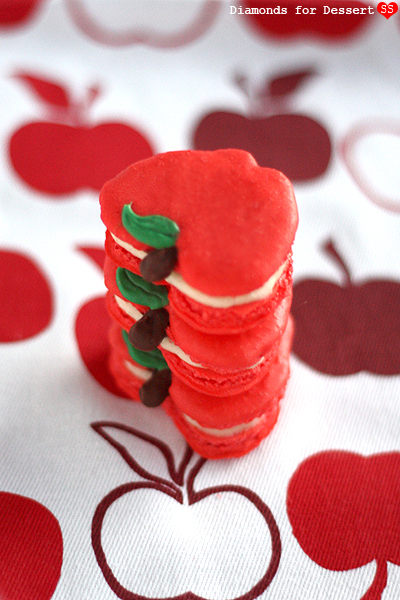 I'm going to straightforward; these macarons aren't very apple-ly in flavor. It's more like cinnamon with a hint of apple. My brother calls them Apple Jacks Macarons, you know, like the cereal, which is actually pretty accurate. But I find them pretty cute, so I couldn't resist posting them anyway. 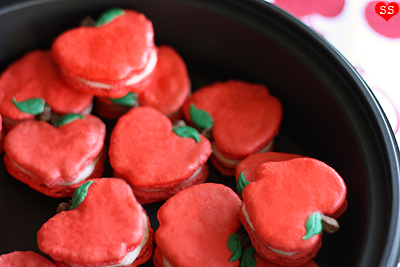 They are technically still Cinnamon Apple Macarons in that they look like apples and taste like cinnamon :). I think if I were to make them again, I'd devise some sort of apple jelly center to up the apple flavor. But despite the lack of apple flavor, they still taste wonderful. Happy Autumn Everyone! Line a couple baking sheets with parchment paper. Tape two sheets of printer paper together to form a large sheet about the size of your parchment. 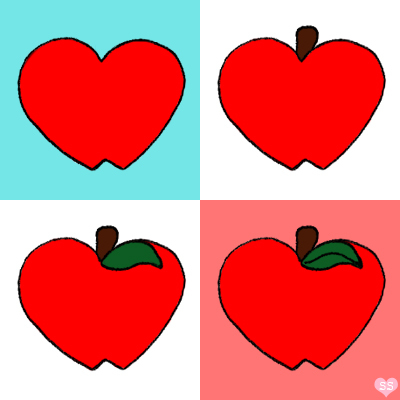 Trace 1-1.5" diameter hearts (I traced a heart cookie cutter) onto the now large sheet of paper and alter the heart outlines as shown above to form the basic apple shape. Set aside for now. Mix the powdered sugar, ground almonds, and ground freeze dried apples together. In a clean bowl, add your aged egg whites and salt. With an electric mixer, beat on low until frothy. Turn up the mixer to high and slowly add in the granulated sugar as you continue to mix till the whites are stiff peaks (when you lift up the mixer, there should literally be stiff, shiny peaks). Add in the red food coloring and mix a few more seconds. With a spatula, gently fold in the powdered sugar/nut/apple mixture until incorporated. Place a plain piping tip in a piping bag and fill the bag with your macaron batter. Now take that large stenciled paper and place it under a piece of parchment, using it to guide you as you pipe out your macarons. When done, slide out that paper and place it under your other parchment and repeat. Let your macarons dry for a few hours, until the tops are completely dry. Preheat the oven to 325°F. 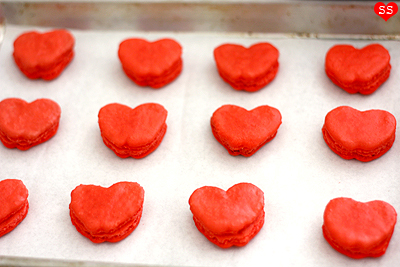 Bake your trays one at a time for 8-10 minutes or until the macarons are set on top. Let them cool on the parchment on a cooling rack. When relatively cool, carefully peel the shells off the parchment. Pair all the macarons up by matching size. Place 1/2 of each pair of macaron shells on a sheet of parchment paper, remembering which shell goes with which. Melt the chocolate chips. Use a toothpick to place a blob at the top of each of the shells on the parchment paper to form the stem of each apple, making sure that the chocolate touches the shell (so it sticks when it dries). Let dry. Melt the green candy melts. Use a toothpick to draw a leaf on the top right edge of each of the macaron shells on the parchment paper. When the candy coating is almost dry, take a toothpick and run it through the center of each leaf to form a vein. Let dry. Carefully pull the decorated shells off the parchment. If necessary, add some chocolate to the bottom of the shell, touching the stem to help it adhere better, and let dry. Once dry, re-pair all the macaron shells. 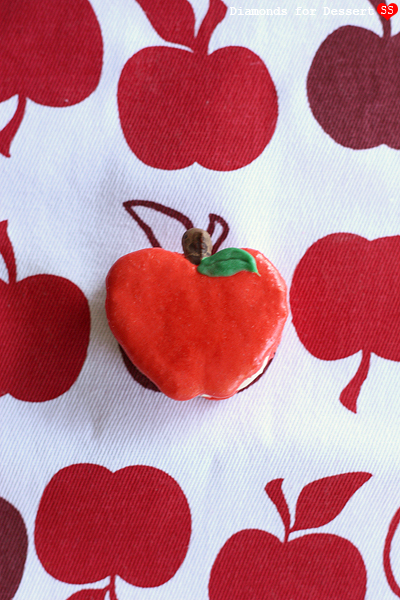 Fill a piping bag with the cinnamon apple filling (recipe below), pipe the filling onto one half of a pair, and sandwich the filling with the matching macaron shell. Once done, refrigerate the macarons overnight to let the flavors meld. Cream with butter with 1/2 cup powdered sugar. Add in the cinnamon. Alternate between adding the remaining 1 cup of powdered sugar and the apple juice. If the filling is too stiff, add more apple juice, and if it is too watery, add more powdered sugar. How sweet! 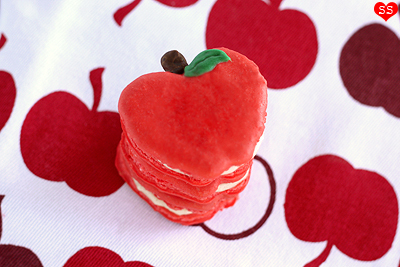 I would like to taste one of this beautiful apple-macarons. STUNNING! God you are amazing. Love this! Sending love from New York City, hope you are well. Please follow me! & like me on Facebook! 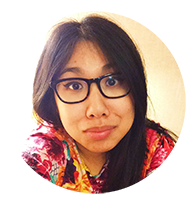 If you have bloglovin, we should follow each other! Hello! that looks soooo goood! i love autumn! and i like how you matched the background. bake some for xmas for us! Yum! This macaroons is looking good. I'm fighting the urge to eat it. It looks so gorgeous and I don't want it to go to waste. These are just so cute. Bet they taste amazing. I love it!! Just shared it on my facebook! Thank you. I got the link from Tip Junkie.